San Diego County – List of Stone Quarries, Etc. San Diego County Granite Industry (circa 1873 through 1974) – “A Brief History of the Granite Industry in San Diego County,” by S. Tom Wood, in The Journal of San Diego History, San Diego Historical Society Quarterly, Summer 1974, Volume 20, Number 3, presented by the San Diego History Center. San Diego County, California – San Diego County Marble Quarries (circa 1894) – “California Marble” (pdf), in Stone Magazine, Vol. VIII, No. 3, February 1894, pp. 254-257. San Diego County Granite (circa 1904) – Excerpts from The Structural and Industrial Materials of California, Bulletin No. 38, California, State Mining Bureau, San Francisco, California, 1906. San Diego County Granite & Marble Resources (circa 1913) – Included in chapter in “California” (pdf), by G. F. Loughlin, in the Mineral Resources of the United States Calendar Year 1913, Part II. Nonmetals, United States Geological Survey, 1914. San Diego County Mines and Mineral Resources (circa 1913-1914) – Excerpts from Report XIV of the State Mineralogist – Mines and Mineral Resources of Portions of California, Chapters of State Mineralogist’s Report - Biennial Period 1913-1914, Part V. “The Counties of San Diego, Imperial,” 1916. San Diego County Mineral Industry (circa 1919) – Excerpt from California Mineral Production for 1919, Bulletin No. 88, by Walter W. Bradley, California State Mining Bureau, 1920. San Diego County Limestone & Marble Industry and Deposits (through 1947) – Excerpts from “Limestone in California,” by Clarence A. Logan, California Journal of Mines and Geology, Vol. 43, No. 3, July 1947, California Division of Mines, San Francisco, California. San Diego County – the Dimension Stone Industry of San Diego County and San Diego County Commercial "Black Granite" (circa 1950) – Excerpts are from Commercial 'Black Granite' of San Diego County, California, Special Report 3, by Richard A. Hoppin and L. A. Norman, Jr., State of California, Department of Natural Resources, Division of Mines, San Francisco, December 1950. "There is a broad, irregular belt of granite running through San Diego County west of the middle of the county. With the exception of a little stone quarried at different points for local use, the only quarries now producing granite are those at Foster and Santee, on the San Diego, Cuyamaca and Eastern Railway, and at the Sweetwater Dam." San Diego County Mines and Mineral Resources (circa 1913-1914) – Excerpts from Report XIV of the State Mineralogist - Mines and Mineral Resources of Portions of California, Chapters of State Mineralogist's Report - Biennial Period 1913-1914, Part V. "The Counties of San Diego, Imperial," by Frederick J. H. Merrill, Ph.D., Field Assistant (field work in December, 1914), San Francisco, California, July, 1915, California State Mining Bureau, San Francisco, California, 1916, pp. 173-370. "The county of San Diego and its former eastern extension, now known as Imperial County, comprise a section of southern California unique in climate, mineral resources and agricultural possibilities. The first of these subjects has become familiar to the tourist and health seeker and has had an important influence in building up the city of San Diego and the population of the surrounding country. The second, to which this report is developed, is of great interest for its variety, and will be, in the future, as it has been in the past, a matter of substantial financial importance. The agricultural conditions are so inviting that they have attracted world-wide attention and have been so attentively considered that they need not be described in detail here…." "The region of San Diego was first made known to the civilized world by the discovery of its bay in September, 1542, by Juan Rodriguez Cabrillo. By the arrival there on June 16, 1769, of Padre Junipero Serra and the establishment in honor of San Diego de Alcala of the first Franciscan Mission in California, this place was fixed as an important landmark in the settlement of the Pacific coast, and claims special prominence in the history of the Golden State. "The county bearing this name, with a present area of 4,221 square miles and a population in 1910 of 61,665, was one of the original twenty-seven counties organized in 1851 by act of the state legislature. At that time it was of much greater extent, its area having been considerably diminished, in 1889, by the separation from it of a part of what is now Riverside County. In 1907 it was still further reduced by the organization of its eastern portion as a separate county under the name of Imperial. "The county is diversified in its physiography, its essential topographic features being an area some 50 miles broad, of parallel ranges of granite, with southeast trend, including the southeastern continuation of the San Jacinto Range of Riverside County. 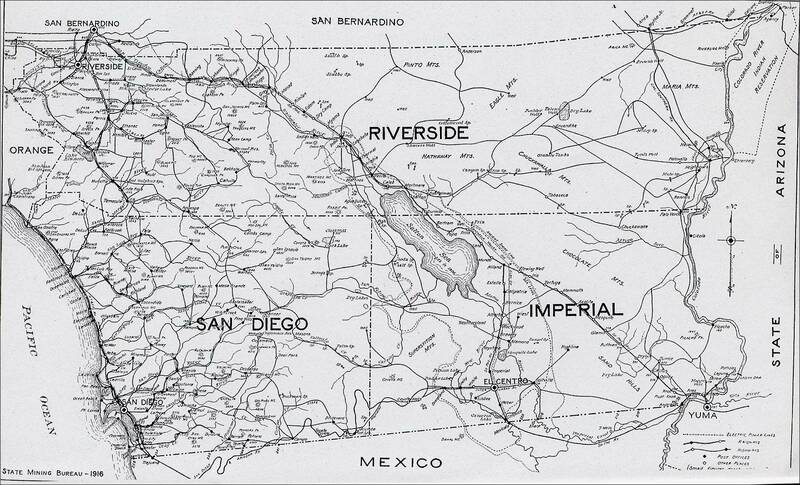 Among these granite ranges are valleys occupied by parallel belts of metamorphic rock, chiefly slate and mica schist, with some quartzite and limestone, having nearly vertical dip and northwest strike, and extending, with many interruptions by granite intrusions, from Mexico into Riverside and Orange counties. About 40 miles northeast of San Diego, in a belt extending northwest and southeast, the altitude of the ranges exceeds 5,000 feet at many points, and some mountains attain greater elevations, as follows: Palomar, 6,126 feet, Hot Springs Mountain 6,400 feet, Cuyamaca 6,515 feet and Laguna Mountain 6,500 feet. These last two are intrusions of diorite or gabbro which, as the geologic map shows, occur here and there in the granite area. Southwesterly from this elevated belt the altitudes decline toward the coast. On the seaward border of the granite, extending northwest some 40 miles from the Mexican line, but only a few miles wide, is an area of volcanic felsite and tuffs, for the most part buried beneath the mesa formations, but exposed at many points and forming the mountain peaks of Otay, San Miguel, Black Mountain and others. On the west flank of all the crystalline formations, lies an extensive mesa or plain of Tertiary deposits, prominent in the landscape near San Diego and gently sloping seaward, from an altitude of about 500 feet at its eastern margin, to an elevation of about 300 feet near the coast line. Thus, between La Mesa and La Jolla, its slope is about 20 feet per mile. From the main divide the surface slopes steeply eastward toward the Salton Basin, and here desert conditions prevail, since the precipitation mostly falls on the western slope. "Many observers have commented on the fact that the slope of the granite ranges is steeper toward the east than the west, for they rise abruptly some thousands of feet from the comparatively level and low lying Tertiary and Quaternary formations of the Salton Basin. Some have attributed their escarpments wholly to faulting, but, on examination of the region, it seem inadvisable to adopt this as the sole explanation. West of the Salton Basin, which is evidently in a syncline, though possibly on a fault line also, is an anticlinal area including minor synclines and having for its main axis, the granite of the peninsular range which trends nearly northwest. The northeast limb of this principal anticline is much steeper than the opposite one which declines toward the ocean. The various anticlinal and synclinal folds are intersected by parallel faults at right angles to their axes and consequently with northeast trend. These faults have cut the formation into blocks which pitch northwesterly. From the relation of the crystalline rock masses on the west side of the Salton Basin to the fossiliferous Miocene Tertiary beds it is evident that a local uplift of some 2,000 feet has occurred later than the Miocene period and probably in the Postpliocene and, to this uplift, in part, some of the more noticeable escarpments owe their present altitude. "Under the first geological survey of California, conducted by Dr. John B. Trask from 1851 to 1856, no work was done in San Diego County. "In December, 1857, in connection with the expedition for the exploration of the Colorado River under Lieut J. C. Ives, Dr. J. S. Newberry crossed the country from San Diego to Yuma. His observations, made in this journey, are on pages 13-18 of the report of the expedition, which is House Document No. 90, of the Thirty-sixth Congress. "Under the Second Geological Survey of the State, in 1872, W. A. Goodyear made a reconnaissance of the county, but his notes were not published until 1888. See Eighth report State Mineralogist. "In 1882 H. G. Hanks, State Mineralogist, visited the Colorado River Desert, as described in the second report. "In all of the reports subsequent to the fifth are published notes on the mineral resources, and these embody geological observations. "In the limited time allotted to the writer for a study of the mineral resources of the county, he has noted all geologic details which came within his observation in visiting the chief areas of production. The sum total of all these observations, combined with facts gleaned in the study of neighboring areas, gives opportunity for a fairly accurate résumé. "It is hoped that the following review of the geology will have a stimulating effect on teachers and students within the county and in its neighborhood, and lead them to make further contributions to our knowledge of the structure of the region. 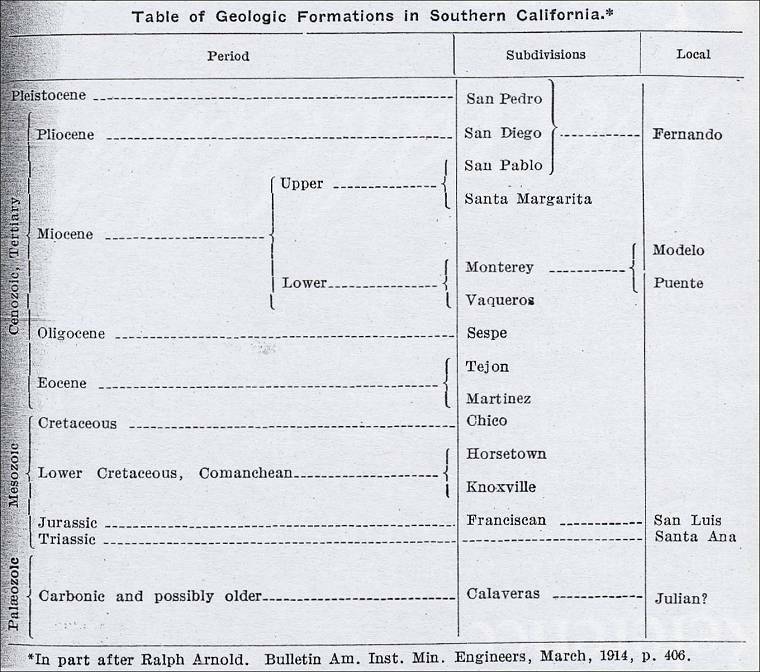 Table of Geologic Formations in Southern California. "No Palæozoic sedimentary rocks in which fossils are preserved are known within the county, but from evidence collected at various points* concerning the metamorphic strata of the Mother Lode region and from Carbonic fossils** found in the Santa Ana Mountains of Orange County, we conclude that, as early as Carbonic time, and possibly earlier, shoal water conditions existed over parts of San Diego County, leading to the formation of extensive deposits of mud and sand, derived from the erosion of some adjacent continental area. These beds possibly rested on a basement of granitic material, though we are not certain of this, and in them, at intervals, thin deposits or lenses of carbonate of lime were formed. At some time subsequent to the Jurassic period, came an epoch of mountain building, during which the rock mass underlying the sediments, above mentioned, in a molten state and under great pressure; or granite from some other source, in a state of fusion, was forced upward in parallel zones of northwesterly trend. In this movement, through the attendant heat and pressure, the overlying sediments were metamorphosed, mud deposits becoming slate and mica schists, sand beds becoming quartzites and limestone being crystallized into marble. In addition, these beds were thrown into folds, anticlinal above the granite axes and synclinal in the troughs between, in the latter, the strata being so closely compressed as to stand nearly vertical. In the lapse of subsequent time, through long erosion, the metamorphosed sediments overlying the granite, have been worn away, leaving the igneous crystalline rocks uncovered in the principal mountain ranges; where the schists, slates, quartzites and limestones have been preserved in the valleys. "Subsequent to this period of mountain building, came a prolonged subsidence of the coast, during which, on the flanks of the upland, sedimentary beds were deposited in intermittent sequence from the Cretaceous through the Tertiary. As Miocene beds are not evident on the west slope, their deposition may have been interrupted by temporary emergence of the land. In the Salton Basin, however, the Miocene is represented by extensive clay deposits, well exposed in the region of Carrizo Creek and bearing proof of their age in the very noticeable bed of Miocene oyster shells (Ostrea vespertina, Con.) which caps them. "At the close of Miocene time, after attaining a maximum of 1,600 feet or more on the coast and 2,000 feet or more in the Salton Basin, the subsidence in the latter was suspended while that of the coast continued into Pleistocene time. Then began a gradual emergence causing the deposits formed during the submergence to be exposed to wave action at successive levels, for the rise of the continental margin was not continuous but intermittent. In the periods of no movement or of less movement, were cut and formed the various mesas, sea terraces and shore lines, which are so conspicuous in the scenery of the coast of southern California. The unequal height of some of these terrace planes shows that the movement was not everywhere the same. The elevation of the land progressed considerably beyond its present limit, and evidence from various sources indicates that the continental margin rose 800 to 1,000 feet higher than it stands at present and since then has gradually subsided. Evidence of the latter movement is seen everywhere along the coast of San Diego County, in the drowned stream valleys, often occupied by salt marshes. Of the periods of volcanic activity little is known except that considerable material of igneous origin has been deposited. "The formations of San Diego County are granites and other igneous crystalline rocks of several ages, metamorphic strata of great age, possibly Carbonic or older, and sandstones, shales, conglomerates, sands, gravel and clays of Mesozoic and Tertiary age. "The granites upon which the metamorphic rocks rest and by which they are intruded, are of several types, some of which Dr. A. S. Eakle has identified and his descriptions will be found under the various quarries. These granites in turn are intruded here and there by basic rocks of the diorite and gabbro types. The latter are cut, at many points, by pegmatite dikes which also sometimes appear as intrusives in the schists and in the granites. Two areas of these basic intrusives form substantial mountain ranges, one traversing the Cuyamaca Grant from north to south, and forming three peaks, of which the southern-most, 6,515 feet high, is known as Mt. Cuyamaca. Ten miles southeast, is the diorite ridge, known as Laguna Mountain, of which the summit attains an altitude of over 6,500 feet. "Sweetwater quarry. Metarhyolite or felsite. A thin section shows a feldspathic polarizing base filled with needles of feldspar, showing flow structure and pale green chloritic matter filling the interstices. Patches of yellow granular epidote, as an alteration product, are frequent. A grayish opaque dust is sprinkled throughout. "Spring Valley. Felsite. A thin section shows a fine indeterminate feldspathic base of needles with considerable green chlorite and altered opaque material. "The felsites may belong to the same period of eruption as the volcanics of Coyote Mountain in Imperial County, which underlie the Miocene clays, but they are of different type, for the Coyote Mountain effusive rocks are basic, and though they are badly decayed and difficult to identify, were probably mostly andesites. "The latest of the volcanics are probably the lava flows capping Tertiary gravels, seen in this county near Jacumba, and reported by H. W. Fairbanks* as occurring on the Santa Rosa Grant in Riverside County. They also occur near the coast south of the Mexican boundary. With these flows are deposits of tufa and conglomerate. "The metamorphic formations are mica schists, slates, quartzites and limestone, the first being especially well exposed near Julian and the latter occurring in small areas at several points. These metamorphic rocks, from their structural position and lithologic characters, may be regarded as probably equivalent to the Calaveras group, described in the Mother Lode Folio of the U. S. Geological Survey and will here be designated as the Julian group. Their exact age is uncertain. "A specimen of the Julian schist has been determined by Dr. Eakle as muscovite-schist. A thin section shows much quartz and slender frayed rods of muscovite. Much magnetite in grains and irregular masses, considerable limonite stains and an occasional apatite prism are seen. "The oldest unaltered sedimentary rock in the county (San Diego) appears to be a black slate which has been encountered in the Balboa, Lo Tengo and Otay oil wells and is exposed on the north slope of Mount San Miguel, on the west margin of the granite. A similar rock is found south of Dulzura in section 22. Here it contains a deposit of jasper. 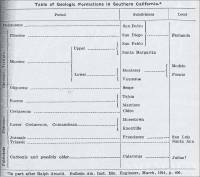 Lithologically it is similar to the material of the San Luis formation which has been identified in San Luis Obispo County as Franciscan or Jurassic (see San Luis Folio, U. S. Geological Survey). A fragment from the Otay well contained a small Avicula. Small outcrops of limestone are reported further northwest. "The Cretaceous strata exposed in this region are of the Chico series and appear in the bluffs on Point Loma and at La Jolla as described by Fairbanks. ** Near the reservoir above La Jolla a specimen of Inoceramus whitneyi was found, which is now in the Chamber of Commerce Museum at San Diego. "As to the Tertiary, while the fossiliferous beds in and near San Diego are chiefly Pliocene, Eocene fossils have been found in Rose Canyon, and, according to Fairbanks,* on Point Loma. Miocene deposits have not yet been identified west of the divide, but are well developed in the Salton Basin. "The Pliocene and Pleistocene formations, in stratigraphy and palæontology, have been fully described by Ralph Arnold. ** To the average observer their chief physical character is manifest in their uniform surfaces which are known as mesas and therefore these merit the following description. "As mentioned under Physiography, a prominent feature of the coastal region of the county, especially in the southwest, is the Mesa, a broad, elevated plain, gently sloping and deeply cut by stream valleys. To the layman this mesa is chiefly apparent by its relatively uneven surface with, here and there, a slight hummock or elevation, rising above its plane. 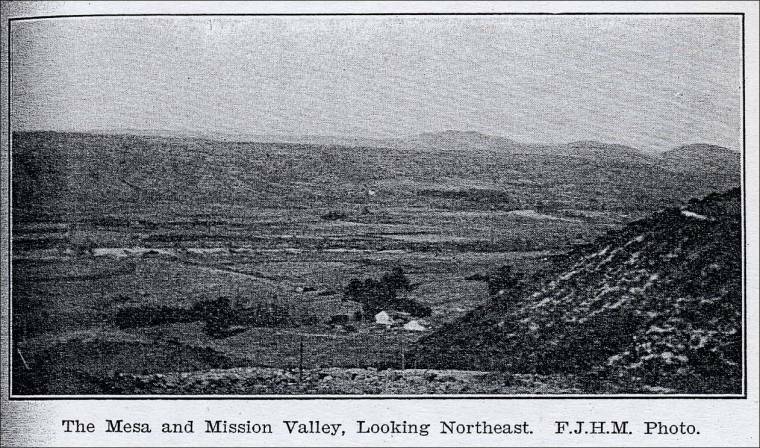 The Mesa and Mission Valley, Looking Northeast. "The geologist, however, also considers its materials as exposed in the banks of ravines and canyons and in cuts made in building roads. The superficial material, exposed from La Mesa westward along the side of Mission Valley and its tributaries, is seen to be chiefly a loosely cemented conglomerate 6 to 10 feet thick, underlain by finer materials of a sandy or clayey character. "On more careful investigation, the Mesa formations are resolved into two divisions: (1) An older mesa, much dissected by erosion, and largely washed away, the remnants of which, at the mouth of El Cajon Valley, reach a height of about 650 feet, and much greater altitude farther northwest; (2) A younger and less eroded mesa, of lower altitude, reaching in the same vicinity, a height of about 475 feet. The latter is the principal feature of the landscape within 10 miles of the coast in the neighborhood of San Diego. "These mesas are remnants of wave-formed terrace plains, developed at such successive intervals in Tertiary time. The upper is probably Pliocene, while the lower may have been formed in the Pleistocene. The shore line of the latter is mainly carved on the deposits of the older mesa, though in places, it rests on the crystalline rocks which underlie them both. The shoreline of the older mesa is quite irregular, extending into the reentrant of El Cajon Valley and into those of Escondido, San Bernardino and others. Its level is marked by patches of loose material and conglomerate on the valley sides and on the hills within the valley, their uniformity of level and material, denoting their common origin. As stated, near Grossmont, the height of a fragment of the older mesa is about 650 feet. On the road to Poway a similar formation exceeds 1,000 feet. In the Escondido Valley it reaches 1,200 feet, and near the north line of the county it is still higher. 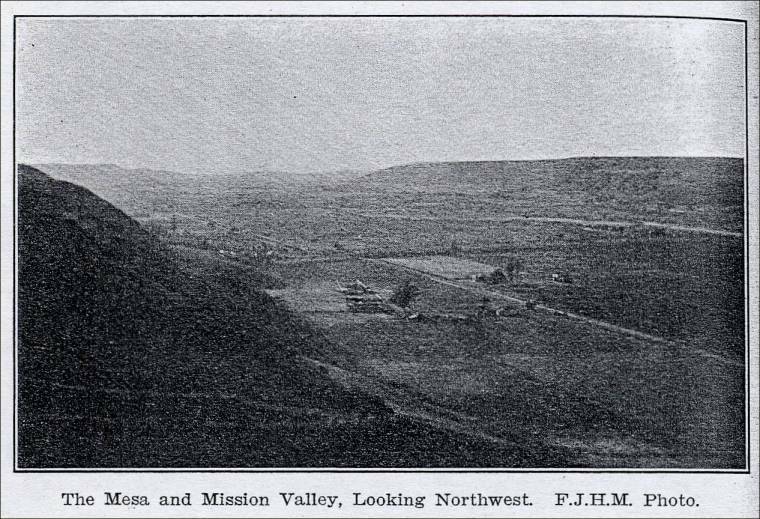 The Mesa and Mission Valley, Looking Northwest. "The (report gives) a concise summary of the mineral resources of the county, based on all accurate information previously on record and supplemented by additional detail obtained by the writer in his survey of the principal mineral areas. Since the time available for field work was limited, the detailed study of some specially important deposits has necessarily been left to future investigation. At the present time, the mineral production of this county is more important in non-metallic minerals than in metals. This is due, both to the decline of gold mining and to the growth of the city of San Diego and neighboring settlements, which has led to the discovery and development of extensive deposits of materials used in construction and in the industrial arts. To a large extent, the mineral resources of this county are dormant, through lack of transportation …." Building Stone (in San Diego County). "With the rapid growth of San Diego as a city and the increasing demand for materials of construction, the use of building stone has rapidly increased and several quarries have been opened in the granites which are so abundant and so easily accessible to transportation. Economy in building, however, is an important factor and the cheaper materials, brick and reinforced concrete, are so generally in use that the more costly granite is chiefly used for monumental and decorative purposes. "No sandstones have been found in the county suitable for building. Near Valley Center is a quartzite which may be fit for quarrying. A few localities of marble are known but have not yet been developed. These are discussed under the proper head. "Granite occurs in this county in great variety and abundance, and in excess of all possible future demands. The determining factors in selecting a location for a quarry are first, quality of material and second, convenience for transportation. The larger granite areas throughout California are, consequently, seldom of commercial interest because through altitude or otherwise, they are usually remote from lines of transportation. The quarries of granite opened in San Diego County as well as those of the other building stones, are, therefore, easy of access….."
"Limestone, which mainly consists of carbonate of lime, is used for building and ornamental purposes, but chiefly in the metamorphic or crystalline form, which is known as marble. "In San Diego County crystalline limestone occurs at many points, in the areas of metamorphic rocks, but owing to lack of transportation in the regions where it occurs, little attention has hitherto been given to this material…." "This handsome ornamental stone is mineralogically aragonite, a form of carbonate of lime often deposited form hot springs. The only occurrence in this county has been reported from the valley of Los Peñasquitos Creek on the grant of that name. * The exact locality could not be ascertained by the writer. "The demand for crushed stone and sand for concrete and their ever-increasing consumption make these materials of great importance to a municipality. "San Diego is especially favored in the extensive area of intrusive felsite which is now quarried at Spring Valley and Sweetwater Dam, and, if necessary, could be quarried at other points. The gravel from the Otay River Valley and from Rose Canyon as well as from other areas around the Mesa is almost entirely of felsite or some other volcanic rock of similar qualities…." "Lime (CaO) is the oxide of the metal calcium and, in some form is the basis of all mortars and cements used for building. When comparatively pure it is common lime, or quicklime. When mixed with a small percentage of clay or silica it forms poor or meager limes, with the increase of clay it forms hydraulic lime, and when mixed with clay in proper proportions and properly burned and ground it forms Portland cement. Lime combined with sulphuric acid forms calcium sulphate, which occurs in nature as gypsum and makes plaster of paris. "The numerous beet sugar factories in this state use large quantities of lime, several quarries being operated for these factories alone. The manufacture of beet sugar being liable to increase in the near future, an increased demand for lime for this purpose can be expected. The remainder of the product is used for furnace flux, as a fertilizer, for mortar and plaster in building operations, in glass manufacture, and other industries. "Lime is produced commercially, by heating limestone in furnaces known as limekilns. Limestone consists of calcium carbonate, which, when sufficiently heated loses its carbon dioxide, which escapes as a gas, and the quicklime remains. Limestone begins to lose carbon dioxide at about 750 F., but requires a temperature of over 1300 F. before it is driven off. In chemically pure carbonate, there are 56 per cent of lime and 44 per cent of carbon dioxide, but there are also nearly always present, some moisture and organic matter, which are driven off, and varying percentages of clay, magnesia, iron oxide, etc., which are not driven off, in the burning. So the resulting lime may vary from 56 per cent to 30 per cent or less of the stone. Moisture in the stone facilitates the burning, so a freshly quarried, moist stone is more readily reduced than a dry one. Hence a dense, compact stone is reduced with greater difficulty than a porous one, but the quality of lime is better. "Lime and cement, as materials of construction, are so important in the development of a city like San Diego, that there is little doubt that in the near future, lime will be burned within the county and that the necessary association of lime and clay will be found at some point conveniently situated for the establishment of a factory for Portland cement. In 1890 a beginning was made with a calcareous deposit on the Jamul grant by the erection of a cement factory. * It was found, however, that at that time, it could not be made and delivered in San Diego in competition with European Portland cement brought by water freight. This deposit, with the whole of the Jamul grant, belongs to J. D. Spreckels and has been carefully experted for him, but not found of sufficient promise to justify further operations. As railroads are built through the county and, with the perfection of the automobile truck, means will be found to make these valuable materials and bring them to market at reasonable prices. "Calcareous materials are not especially abundant in the western part of the county, for the Tertiary deposits conceal palæozoic and mesozoic strata which may be calcareous. We must, therefore, look chiefly to the country east of the mesas where, in the metamorphic formations, are numerous limestone outcrops. One of these is near Deer Park east of the Cuyamaca Grant,* another is in the area east of Warner's ranch. On the road to Oak Grove there is said to be an old limekiln near Deadman's Hole. On the eastern slope of the divide, in the region of Jacumba and northward from that point, an abundance of limestone is reported. An outcrop of this material occurs 4 ½ miles northwest of Borrego Springs. Some of these deposits will be made accessible by the San Diego and Arizona Railway, now under construction. "In the mesa itself, near Otay, is a calcareous layer not far below the surface. A similar deposit occurs near Lemon Grove, but these are of insufficient thickness, so far as known, to be of commercial interest." San Diego County Mineral Industry (circa 1919) – Excerpt from California Mineral Production for 1919, Bulletin No. 88, by Walter W. Bradley, California State Mining Bureau, 1920, pp. 161. Location: Extreme southwest corner of state. "San Diego ranks thirty-first in the total value of its mineral output. This figure for 1919 equaled $343,230, as compared with the 1918 output worth $1,942,150, the drop being due to potash. In 1918 for the only time in several years, there was no production of gems, in which San Diego County has lead the state. Aside from minerals commercially produced, as shown below, San Diego County contains occurrences of bismuth, lithia, marble, nickel, soapstone, and tin. Potash has been produced from kelp. "A development of the past four years is the shipping of pebbles for grinding mills. San Diego County, 1916 Map, from California Mineral Production for 1919 (with County Maps), Bulletin No. 88, by Walter W. Bradley, California State Mining Bureau, San Francisco: California State Printing Office, 1920, pp. 199. "San Diego was the largest of the original 27 counties of the state. Major parts of San Bernardino and Inyo Counties were carved from it by the first state legislature in 1851. In 1889, Riverside County was formed from the northern half of the remainder, and in 1907 the area of the county was again reduced about 50 percent by the creation of Imperial County on the east. Many of the limestone deposits mentioned in old publications as being in San Diego County are therefore mentioned in Imperial and Riverside Counties in this report. "Although there are several limestone and marble deposits in the interior of the county, their development has been limited by the lack of rail transportation and the lack of any nearby market of importance except the city of San Diego, the rapid growth and importance of which have come only in recent years. Besides the railroad from the north which runs near the coast and has two short branches reaching only short distances inland, the San Diego & Eastern Railroad runs 22 miles northeast from San Diego to Lakeside, and the San Diego & Arizona Railroad serves a few townships in the extreme southeastern part of the county. The tentative boundaries of two state parks cover most of the eastern desert portion, or over 25 percent of the area of the county. Although only part of the land within these boundaries is actually under state control at present, the result is adverse to mining. "The Jurassic granitic rocks of the Peninsular Ranges outcrop over much of the interior of the county and most of the limestone and marble deposits are roof pendants upon or partly invaded or enfolded by these intrusives. These limestones are probably Carboniferous. Marls near Lakeside and Otay are associated with the younger sediments. "The last recorded production of marble was in 1923; the last recorded production of lime was in 1925. "One of the earliest attempts to make Portland cement in California was started in 1889 on the Jamul Rancho 18 miles southeast of San Diego. It was a short-lived venture, due to cost of transportation."